Jimmy Fallon challenges Riz MC to a turn on the "Freestyle Generator." 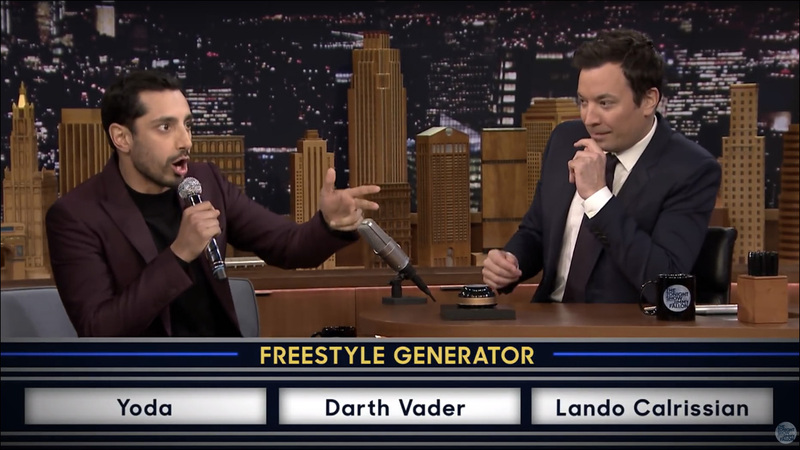 Actor and rapper Riz Ahmed, who can be seen in the upcoming Rogue One: A Star Wars Story, was recently a guest on The Tonight Show, where Jimmy Fallon put the rapper's rhyming skills to the test. Ahmed, aka Riz MC, was challenged to spin the wheel of the "Freestyle Generator," in which he was given three random words and had to work them into a freestyle rap. Naturally, the three words were Star Wars-related. But what in the world would he rhyme with "Lando Calrissian"? Backed by The Roots, no less. Mic drop. Ahmed appears as Rebel pilot Bodhi Rook in in Rogue One, which opens in theaters on December 16. You may have also seen him delivering one hell of a starring turn -- one of the best performances of the year, in my opinion -- as a young man accused of murder in the HBO miniseries The Night Of. In addition to his currently red-hot acting career, Riz MC is one-half of the hip hop duo Swet Shop Boys with Himanshu Suri. They recently released their debut full-length album Cashmere. Is it me or is this guy having a hell of a year?